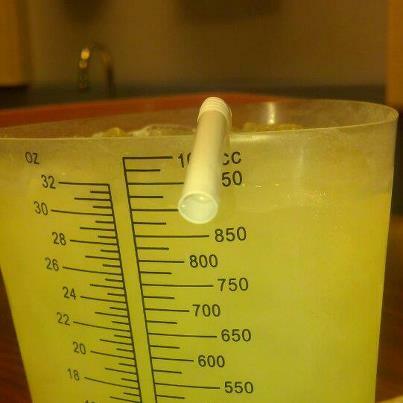 What you drink before a cat scan. Forty-two years I’ve made it in life without the need for x-ray dye. Let’s just say I’ve been pretty darn lucky as far as my health is concerned. Yesterday I learned the hard way that I do have an allergy. Let me back up two days and start from the beginning. I was amazed at the endless supply of bile. That food dissolving juice in the pit of my stomach wasn’t doing me a damn bit of good coming up at 30 mph into the trash can. That’s if I made it to the trash can. Thursday morning I inadvertently woke my son Jarrid with the tune of my guts attempting to become an external organ. He and Zeth were both concerned about all the retching I’ve been doing. And I was concerned also, especially when blood started coming up making the foam a light pink color with red sprinkles. Hi ho, hi ho, off to the Emergency Room we go! I entered the ER vomiting and they took me back immediately to give me anti-nausea medication and then sent me back into the waiting area. Jarrid and I had two plus hours of chat time and I must admit, that part of the trip was pleasant. That was the only part that was pleasant. Eventually I was called back and it was decided I should have a cat scan of my stomach with contrast dye. I was wheeled to the cat scan area on a litter and then transferred to the skinniest table I’ve ever seen to have the scan done. The x-ray tech had two forms for me to sign; permission to administer the cat scan and permission to treat should there be any adverse side effects during the scan. I signed away, careful not to slide off the anorexic table, then raised my hands above my head and waited. The tech said, “This might make you feel like you’re peeing your pants.” I smiled at the though since I had done pooped my pants several times in the past few weeks. Hell, a little pee would be nothing! I felt the injection enter my veins and was flushed with warmth. The pleasure ended there as I felt my throat constrict. I knew immediately something had gone haywire. The attendant asked what was wrong and I grabbed my throat. “Can’t breathe!” I managed to get out. Things started getting fuzzy about then. I heard the attendant say, “she was just fine! What is going on? !” I realized she wasn’t talking to me and there were two more women in the room with us. One said, “should I call code?” The second said, “I don’t know!” and the third yelled, “yes! Call code!” I was hoping they wouldn’t opt for rock, paper scissors to decide who was going to hit the code switch at this point in time. Seconds later the room filled with people. Roughly 25 people filled the cat scan room and the attendants were no longer needed. No one knew my name, where I came from or what was wrong. There was no “crash cart” in the cat scan room, which makes no sense. The doctors were screaming for oxygen 100% and an Epipen and neither were on hand. I’m hearing all this and they’re asking my my name but I couldn’t speak. Things got darker and darker while my body was spazzing in strange fits. I vaguely remember hearing, “she’s seizing!” and “don’t let her fall off the table!” and my final thought was….why is the table so freaking skinny?! I started to come out from the foggy “other side” just in time to vomit in the oxygen mask. A doctor pulled it off my face and to repay him, I shot bile in his direction. It’s not like I had control of the bile then or in the past three weeks. I was able to breathe in the oxygen and gain full consciousness. It was shocking to see all the faces around me. It seemed like one person from every nationality was standing by my side. Well, sides, head, and feet, which was good because I sure didn’t want to fall off that poor excuse for a table. As I was wheeled out I overheard a nurse say to the doctor I puked on, “You win for most exciting patient today.” Lucky him. So now I know, the hospital knows and everyone that was in that general area on Thursday knows: Patricia Crider has an allergy to x-ray contrast. Hmmmm shellfish as in crab, shrimp etc? I’ve never had a reaction to any seafood. guess they will be stocking the room with epy pens as they should be there already. shame on the hospital for not being prepared! happy you made it thru that and still praying for you Pattie. Thank you Michelle! I’m feeling somewhat better and hoping this is a turning point! oxox P.
Glad your ok Pattie. Although I don’t have an allergy to the dye…this brought back lots of memories from many ct scans. Def gives ya a warm feeling like u peed your pants..lol! 🙂 xoxoxox love you, so glad that things are better muuaahhhhhh (been there too honey) you or dale text me when you are up to having a visitor…..
yes darling, that’s why where I work we ALWAYS ask the patients “do you have any allergies to such and such?” What the hell was wrong with those people??? glad you’re OK! They did ask me but I had never received contrast dye before so I said no. I can’t blame them! It did seem to take forever for them to get the reaction reversed though. Is this the Sassy I’ve known for years??? ?